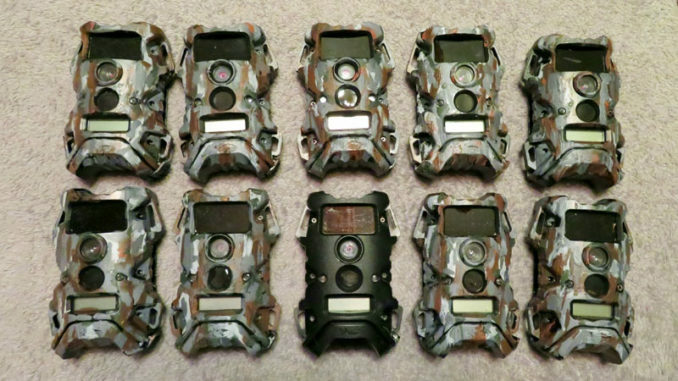 This photo shows 10 trail cameras — nine the author painted himself and one unpainted. Springtime is when I finally take my cameras out of the woods and paint new ones bought on clearance for the upcoming season. Since I only hunt public land, I’ve always used cheap cameras. There are three very important features I look for when using a trail camera: quietness, no-lights and coloration. I’ve been running dozens of cameras annually, upgrading with newer ones as some get destroyed or stolen. Every season I get hundreds of different bucks on film. This allows me to only hunt the most mature buck-visited locations within the two dozen or more units I scout. 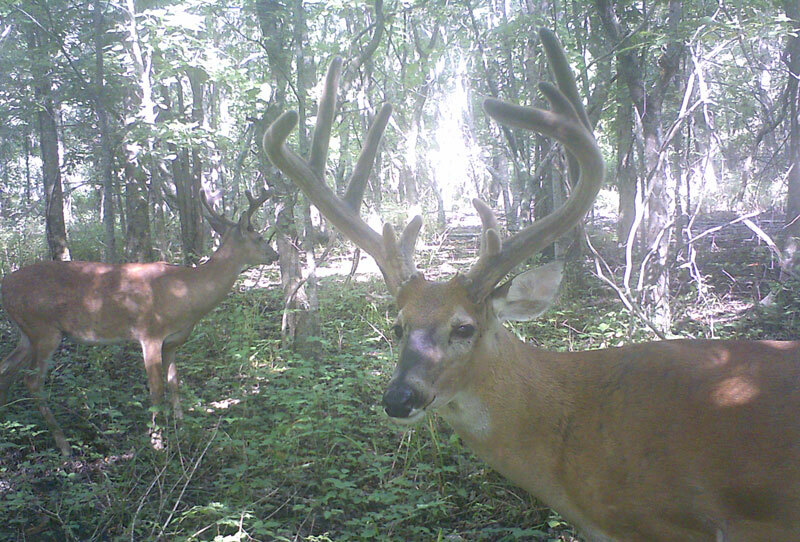 A common theme is when mature bucks notice a camera, they seldom return. Often when a daytime buck notices the camera he becomes nocturnal at that location. Sometimes he’ll come back, but, he closely watches the camera awaiting the non-natural feature that alerted him. With this second spooking, a buck is gone for good. After seeing the red lights from the author’s older camera, this buck was never filmed again. I usually have several cameras in an area, so I often know when a buck leaves or stays. 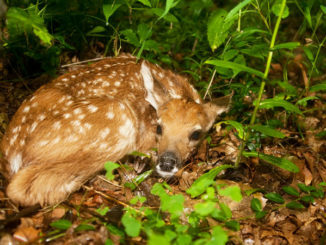 So what scares away these smart public land deer? Light – Nowadays blackout cameras are very common, so I won’t buy a camera that doesn’t have this feature. Sure you’ll sacrifice some nighttime range, but to avoid spooking the buck is worth it. 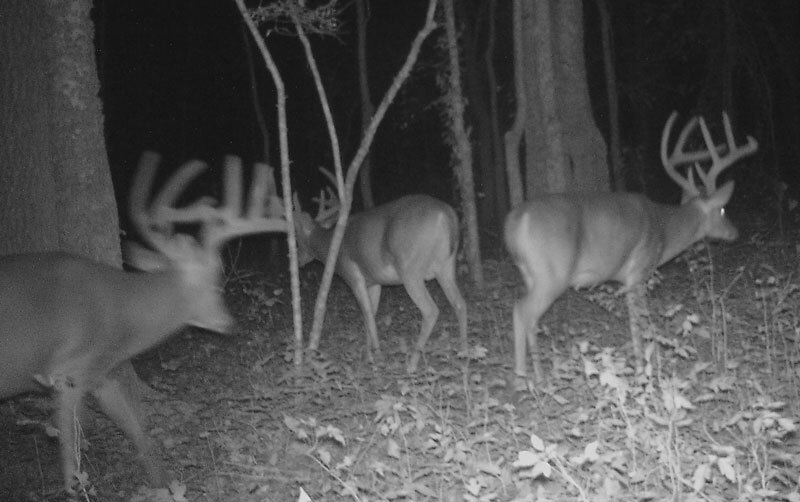 Some bucks may not mind the flash of a red LED light. However, in my experiences, more often than not it’ll send these smart bucks running for the hills. The lights also can give away a hidden camera position to thieves. 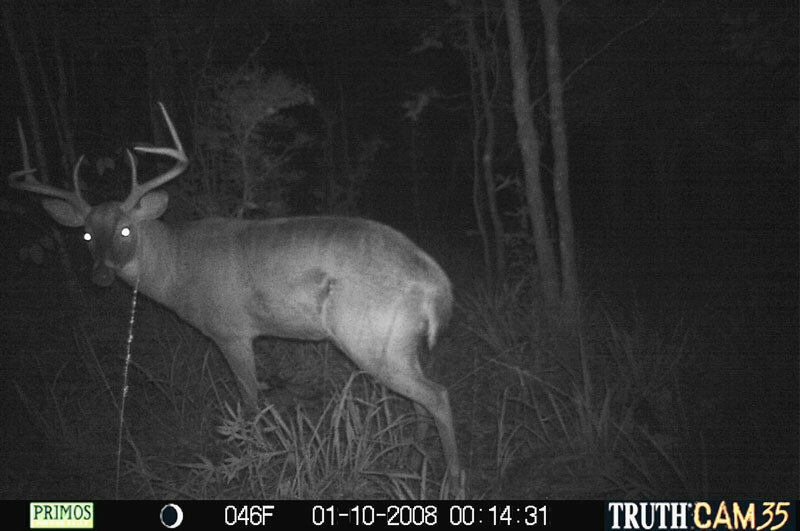 A blackout camera never alerted any of these bucks and they often returned to feed. Camera sound – Loud cameras that make a click to record will instantly spook an animal with the unnatural noise. Sometimes they’ll sprint off. Sometimes they’ll stay for multiple sets to investigate. Then, they leave the area for good. I was frustrated for years with noisy Primos cameras constantly breaking and other brands having horrible overly-sensitive triggers. I put cameras in thick locations to hide from people. Also, these dense tangles are where the public land animals move best, so a sensitive trigger is not helpful around all this brush when the wind blows. The wide spreading sensors of some more expensive cameras have performed poorly in these brushy areas. I’m looking to scout many areas in the cheapest way possible. The good news is some of the cheapest cameras have proven to have all the qualities I like. I first snatched up some Wildgame Innovations Cloak cameras a few years back. I was surprised at how durable they were after using over a dozen in Colorado and in the Louisiana humid heat for two years. I even left a bunch over the winter in the Rocky Mountains. The next year they all fired up without a flaw. I was impressed. The cameras have great battery life and are simple but effective. They have a less than one second trigger for both video and picture mode with hardly any false captures of moving brush. Many other cameras had the same fast picture taking ability, but they took nearly 3 seconds to start in video mode; this often missed anything that passed by. I love video mode for capturing fighting bucks and chase scenes during the rut. I found the Wildgame Innovations Nano model had a trigger that was too under-sensitive. However, all the same great features in the Cloak versions came on with their Terra models as well. I’ve been able to find the Cloak and Terra 6, 7, 8 and 10gb models all for under $33 a piece with freeshipping and no tax by searching eBay and Google Shopping for deals that sporadically pop up. The deals are frequent after the season when places clear out last year’s inventory for upgraded models. These Cloak and Terras do have the slightest noise, but rarely is it loud enough to spook an animal unless it’s practically standing next to the camera. For the low price it’s worth the tradeoff. I find the cheapest SD cards by buying them in large lots on eBay. Inexpensive class 4 cards work well with my cameras. Also, I find bulk AA alkaline batteries online. They last just as long as the name brand ones for a quarter of the name brand price. Camouflage – I notice that animals aren’t spooked by my painted trail cams once they look in their direction. However, I’ve had the plain black, green or grey ones and had animals spook after spotting them. Unfortunately, many cameras on sale are often non-camouflaged. Well no need to spend more money on expensive models. The cameras can be self-painted for only pennies in cost. This buck looking at the author’s self-painted camera wasn’t spooked and returned many times. I use small paint brushes to color them mostly grey like the majority of trees I set them on. I take white paint and stir in black to create various grey shades. I paint on some browns and mix a touch a black to darken the browns. Then, I finish with a small amount of green paint adding in some black to get the desired tone. Deer seem to not notice and not be bothered by my camouflaged cameras when they are looked at. Most importantly, camouflage matters most to keep cameras hidden from thieves, and also from bears and elk, which both like to destroy cameras. I’ve set numerous cameras on carcasses in Colorado and popular bear locations in Louisiana. Bears have looked right at my camouflaged cameras and walked on by, but when the same bears saw my non-camouflaged cameras nearby they were instantly demolished. Keep in mind, if the camera has a flashing red light or makes a loud noise the elk or bear angrily attacks it, no matter the color pattern. The main reason I paint my cameras in the spring time is for the smell factor. I’m very picky about my scent control measures when hunting. I’ve had big bucks bust me downwind when not taking precautions. 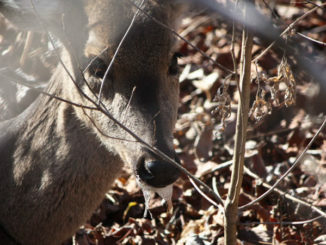 Vice versa I’ve taken several nice bucks that came from downwind when I did take extreme scent measures. So I take the same approach with my cameras. I paint them and leave them in a covered outdoor area for months to allow the scent to fade away. I make sure to wash my camera-setting backpack and camera straps in scent free clothes wash and leave my bag outside for months all spring as well. Bears also have remarkable smelling ability which is another reason to take the scent control methods. Sure gluing on real treebark, moss or leaves to the camera makes it even more stealthy. However, I found this to be unpractical as most of it fell off during my long hikes. I’m resetting dozens of cameras over many different locations all year long. Also, most glues have an unnatural smell, so I wouldn’t want to glue on the extra cover when I set them. My next article will talk about my camera setting tactics, and why I rarely set cameras up high angling downward. All of these measures may seem extreme to some. Yet, my deer hunting success has skyrocketed in the past few years with an ability to not only find the bucks, but to keep from alerting them of the surveillance without spending top dollar.